Overall forecast remains on track. 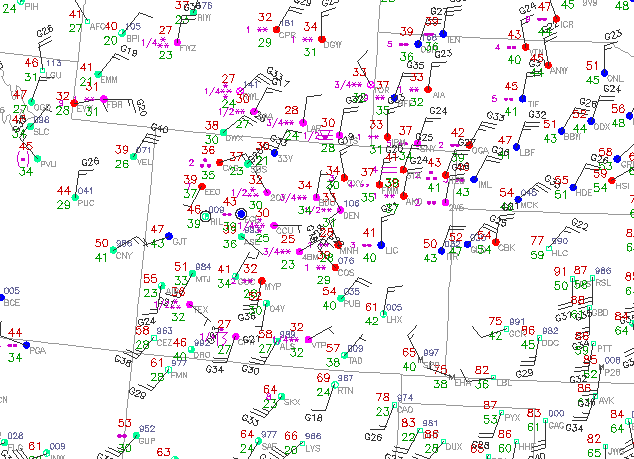 Weve changed from rain to snow in nearly all locations along the Front Range urban corridor. Temperatures will fluctuate little throughout the rest of the day, maybe raising a degree or two with such a high sun angle, but will stay at or near freezing for most locations. Precipitation is expected to transition to all snow for lower elevations, and stay so through Sunday night. 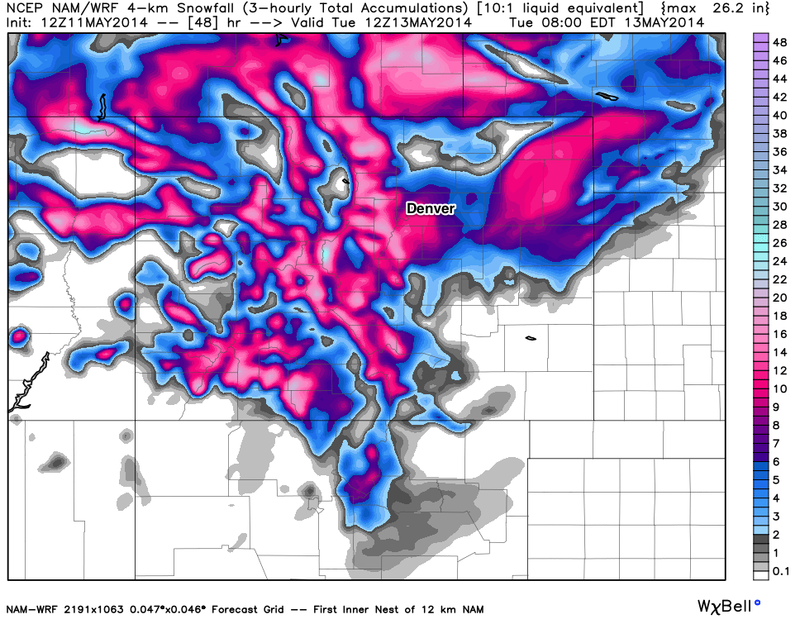 We are still expecting 4 to 9 inches of snow in Denver through Sunday night, with locally higher amounts possible. Totals will vary greatly depending on how much melting occurs, and the elevation of one specific spot to the next. In any case, as we have already seen this morning, the wet slushy snow will be a great burden on our trees. Expecting an increase in power outages as we head into the evening and overnight hours across the entire metropolitan area. As expected, temperatures have been very cold already with this system. Temperatures will remain well below normal through Tuesday night, challenging overnight record lows both Monday and Tuesday morning. Temperatures will fall from the low to mid 30s this afternoon into the upper 20s tonight for Denver. Snowfall totals will be downright impressive at higher elevations. Snowfall totals for the foothills and Palmer Divide could easily exceed a foot by the time this is all said and done. Already reports of more than 15 inches from a few mountain locations north and west of Denver. Wyoming has been dealing with snow since late last night, leading to over 100 miles of I-80 being closed from Cheyenne west. 12z models continue to stand behind impressive snowfall totals for the Front Range foothills, Denver, and the Palmer Divide. We will also need to watch a few locations east of Denver where a Winter Weather Advisory is in place for a shot at heavier snowfall later this afternoon. The NAM, and other high resolution models continue to like a swatch of heavier snow extending northeast off the Palmer Divide later this evening. To reiterate, a high impact snowfall event is unfolding across northeast Colorado. Snow is expected to continue through Sunday night and into Monday. If you have travel planned, in the areas that we have highlighted as most likely to see significant snow and wind, you need to be prepared. I-25, I-70, I-76, will all be dealing with significant snow and wind, making your "easy" travel options somewhat limited. Warm ground will help keep the main roads (outside of the mountains) wet for a while. However, as temperatures continue to plummet tonight, even main roads will become tricky. Bridges and overpasses will be the first to freeze up, so you need to be prepared for rapidly changing driving and road conditions as we get deeper into this event. As weve been highlighting for days, aside from travel the highest impacts will be downed trees and power lines. Well have more updates through the afternoon and evening. If you are not subscribed to Weather5280, please do so. Well continue to post updates on our Live Blog through the duration of this storm, as well as on social media. Here are a few very snowy Mothers Day scenes from across the region this morning. Well have more images and video to share in future updates.